When polar areas and their endangered condition due to climatic changes are mentioned, most people immediately think of a sad picture of a polar bear that is compelled to swim over large distances in search for an iceberg somewhere in the North Pole region. Although being excellent swimmers, polar bears are unable to survive in those regions without ice. Disappearance of the ice cap during summer months and the threat to ice bear habitats have become the symbol of endangered condition of the ice-covered regions caused by recent climatic changes. The scientific community is unanimous in their confirmation of the existence of global warming, as well as of the responsibility of humans for recent changes, which has been confirmed also by the latest report of the United Nations’ committee on which several thousands of scientists worked. Of course, there are also natural exchanges of ice ages caused by the change of the Earth’s orbit or by the tipping of the Earth’s orbit, the so-called Milanković’s cycles. However, they do happen on time-scales of thousands of years and cannot be taken as an explanation for the recent accelerated increase of temperature. Although these changes are global, they do not affect equally all the regions. The most threatened ones are those in the polar circle. In summertime, almost all ice melts in the North, whereas the coastal regions in the distant South experience one of the highest temperature increases on the Earth i.e. 2.5 °C in one hundred years, on the top of Antarctic Peninsula. 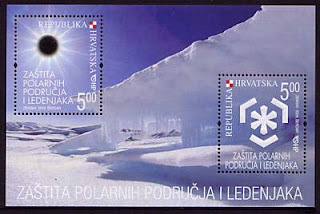 For instance, disintegration and melting of the ice shelf Larsen B 2002 on the Antarctic Shelf, an ice shelf with an area eight times the area of Croatia’s island of Krk, caused a surprise among the scientific community because no one could foresee such a rapid development in that direction. For all the above mentioned reasons, the period 2007/2008 was proclaimed the International Polar Year, on the occasion of which the scientists carried out a number of projects and measurements, with the specific purpose of better understanding and protecting the polar areas and glaciers. In the last 125 years of modern science, it has been the third time that the world joined its forces in the research of the polar areas, the last time in the distant year 1957/1958 on the occasion of the World Geophysical Year. 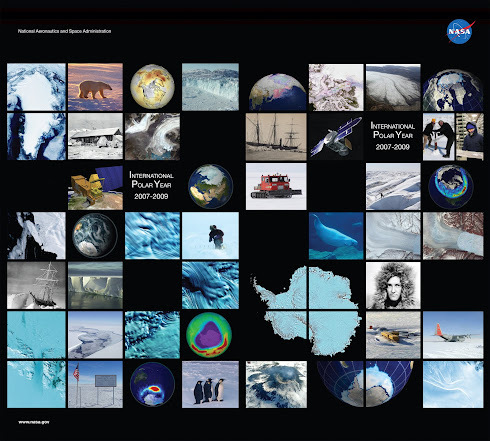 The projects related to the Polar Year are due to be finished in March 2009 and therefore it is very convenient that the issue of a commemorative stamp on the protection of the polar areas coincides with the end of great effort in science to research and protect them better. An important issue has been left open: what we as individuals can do to protect the polar areas. Although we are very far away from them and our country is small, we can still make quite a difference. The atmosphere is getting warmer and warmer under the influence of glasshouse gases and it is not irrelevant where they arise from. The Western world generates enormous quantities of these gases and a fair part of them is superfluous and their emission can be reduced. As a nation we can plan the sustainable development which will not be an additional threat to the Earth and as individuals we can save and more efficiently use the energy; we can plan better and reduce our "imprint" in the emission of glasshouse gases, in order to help everyone on the planet to keep their habitats, even the polar bears from the beginning of this text. 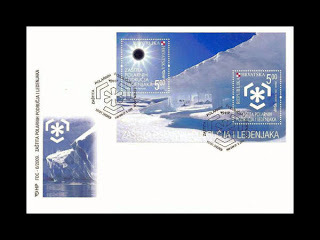 We do believe that the issue of this commemorative stamp will have a certain impact and contribute to rising of awareness on the necessity of protection of the polar regions and glaciers.